Pacific (888) Poker has a great offer for all sports fans with their "Knockout Offer"! November the 3rd is a spot on the calendar that should be marked by any sports fan and you can be part of the action through 888 Poker. Denmark's Mikkel Kessler travels to Cardiff to take on the "Pride of Wales" Joe Calzaghe in a fight for the title of Super Middleweight Champion of the World. The event is being held at Cardiff's amazing Millennium Stadium, which has a capacity of 72,000. Those lucky enough to be at this magnificent venue will witness sporting history. This fight promises to be the UK's biggest boxing event! 888 Poker is giving nine players the chance to take a friend to this once in a lifetime fight for as little as $3! 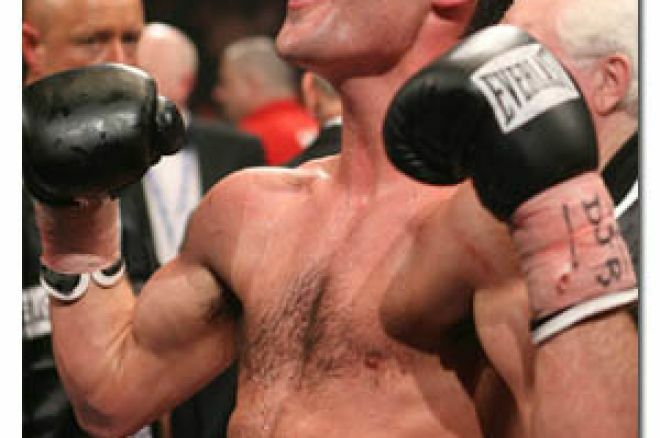 Pacific Poker will be hosting two "Calzaghe v Kessler" qualifiers. The top four finishers in the first tournament on October the 18th at 20:00 GMT will win two seats for the big fight, whilst the top five finishers in the qualifier on the 25th of October will win a pair of seats. This is where the offer gets very exciting! The nine qualifiers will play a live tournament at Cardiff Rileys (Cardiff City Road) on November the 3rd at 3pm, just before the fight. The winner of the tournament will get two ringside seats for the fight! This will be a sensational experience for the lucky winner and a friend as they rub shoulders with the celebrities' ringside and watch the action up close. All nine winners will win more than just a pair of seat for the fight. 888 Poker will provide accommodation for everyone, truly making this a weekend to remember for you and a friend!